In the mid 1990s I taught English in Xiamen, a coastal city in southern China. Xiamen (also known as Amoy) has a lovely subtropical climate, and today it’s a favourite holiday spot among the Chinese. But from 1842 to the Second World War, it was a treaty port. After the First Opium War, the British took over Hong Kong and forced China to allow foreign consulates to be built in Xiamen and four other port cities. The aesthetic result, at least in the 1990s (I haven’t been there recently), was an appealing and, to Chinese eyes, exotic mix of European-style red brick buildings. Xiamen even sounded exotic: I was told that the area had more pianos per capita than anywhere else in China. I recall weekends wandering Gulangyu, the small island near Xiamen where most nineteenth-century Europeans lived. I’d visit the colonial churches, ramble through the ruins of a consulate building, and climb the hill for a commanding view over land and ocean. Often someone was playing Chopin or Schumann in the distance. The psychological result of treaty ports like Xiamen was less idyllic. Some Chinese considered the foreign architecture and western melodies as relics of national disgrace. The Opium Wars stand as a low point in Chinese history, when greedy militarist Europeans took advantage of a corrupt Qing dynasty. During my time in China, this past seemed to be fading away. The return of Hong Kong to China in 1997 and the nation’s remarkable economic growth were signs that the era of shame was ending. China had once been a great power, and was becoming one again; or so state-run media assured us. I was teaching at a school for foreign language teachers. It was relatively unusual at the time to have a native speaker teaching English, and my students recognised their good fortune. We regularly met outside of class just to practise conversation. It was a fair trade—they helped me improve my Chinese too. An occasional topic of discussion was empire (really! )—usually the reach of America’s empire, but China’s as well. I had noticed how often students intimated that countries like Vietnam, Mongolia, or Malaysia were really part of “Greater China.” It’s worth noting that immigrants from China—even if they’re citizens of another nation—are referred to as Haiwai Huaren, “overseas Chinese.” In a sense, wherever one finds overseas Chinese (even if they went overseas two centuries ago) there you find China. “So where does China end?” I asked. After a flutter of Fujian dialect I couldn’t follow, one clever student suggested, “Maybe the USA.” Everyone laughed at his good-natured daring. America the edge of a Chinese empire. In 1994 it sounded funny. It’s hard to comprehend how different the world looks twenty years later (this is one pleasure of getting older: you recognise the cycles and changes of history because you’ve lived through a few of them). Even after two years in China, and travels from Kunming to Beijing, I couldn’t imagine China as a possible inheritor of the US’s place as world power. That China’s influence would grow seemed obvious; that more of its young people would travel, study overseas, and transform their homeland seemed likely. But a global economic and cultural powerhouse? Not for a long while. Fast forward twenty years, and China’s fingerprints are all over the global economy. We in Australasia might be thankful for this: the Chinese appetite for Australian minerals and New Zealand dairy kept these two nations steady while everyone else was sinking in 2008. But the shift is more profound. Chinese immigration and investment are changing the architectural look of “western” cities. To my eyes, the skylines of (say) Perth or Vancouver resemble Hong Kong more than New York. Hollywood has become more China-friendly, and any list of the most influential contemporary artists would include Ai Wei Wei and Zeng Fan Zhi. To be clear: I’m not China bashing. Rather I’m suggesting that the global cultural influence led by Europe in the nineteenth century and the United States in the twentieth has almost certainly shifted to Asia, and especially Chinese-speaking Asia. Some of us in the west are learning a new aesthetic. Case in point: Brisbane, Australia in December 2013. I was staying near South Bank, the lively cultural district along the Brisbane River. The district’s turning point, appropriately enough, was World Expo 88, which transformed a derelict industrial space into a global village. Brisbane has built on this cosmopolitan heritage to create a district that looks towards Asia as much as Europe or the Americas for its inspiration. Walk the length of the district, and you’ll think of Singapore’s Sentosa rather than any of Europe’s river cities. I felt it the moment I saw the walkway of hanging Bougainvillea (which happens to be Xiamen’s city flower) leading to the family friendly, manmade beach. Still doubting? You must have missed the Nepalese pagoda or the statue of Confucius. According to the 2011 Census, Asian Australians make up about 8% of Brisbane’s population; by comparison, Asian Australians make up 15% of Melbourne and 19% of Sydney. Some trace their families back to the nineteenth century: most famously, many Chinese came to the Australian goldfields in the 1850s. But the twentieth century was marked by the White Australia policy, a legislative regime that severely restricted non-European immigration. Remarkably, these policies were only dismantled in the 1970s. Asian immigration—from China, but also from Vietnam, India, and elsewhere—has grown considerably in the past four decades, and so has Asian tourism. So Australia’s multicultural image is a relatively recent phenomenon, and one that the tourism departments are happy to promulgate. But I don’t think the Asian aesthetic of central Brisbane is simply a canny tourist move. It’s a city that recognises both the long and recent history of Asian migrants to Australia and the likelihood that recent trends will continue. What was once considered Asian is now considered global. The standout of any visit to Brisbane, and the poster project for seeing Brisbane as a global city, is Brisbane’s Gallery of Modern Art. 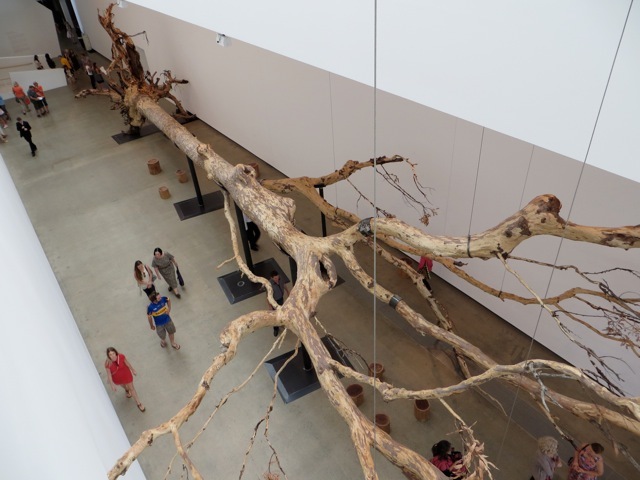 To my mind, GOMA is one of the world’s most exciting museums of contemporary art. It sports a spectacular building and a first-rate theatre for cutting-edge film programmes. But best of all and most important, it exhibits challenging works created by artists from all over the world, curated by people who know how to put diverse works in dialogue with each other. Works from Korea or India share wall and screen space with works from Haiti or the United States. There are some famous names here, but I don’t go to GOMA to see recognised masterpieces; I go to see what the art world is thinking right now. 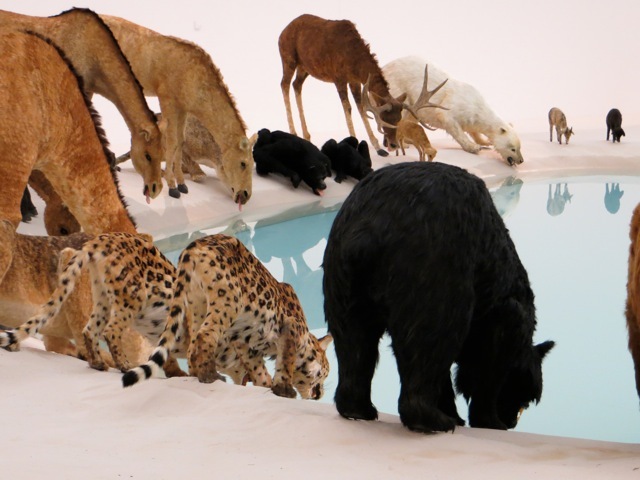 GOMA’s current exhibition is Brisbane’s summer blockbuster, Cai Guo Qiang’s “Falling Back to Earth.” The mere fact that Brisbane’s most celebrated exhibition features an artist whose name most Australians can’t pronounce is telling (try tsai gwo chang). Cai comes from Quanzhou, just up the road from Xiamen, but he moved to Japan in 1986, and since 1995 has lived in New York. But many of the works that brought Cai international recognition utilised that quintessential Chinese invention, gunpowder. Cai gained wide acclaim for his pyrotechnic displays at the 2008 Beijing Olympics. A more modest achievement, his “Nine Dragons,” is on display in the Queensland Art Gallery and uses gunpowder to recreate the iconic dragons of Chinese myth. The volatile qualities of this medium can be wonderfully evocative: the Brisbane work suggests the fiery remnants of the dragons, breathing new life into an ancient and familiar image. But it can also, um, backfire: two of Cai’s previous Brisbane displays literally fizzled out. “Falling Back to Earth” includes three large works: two new, one old. Each work has a large space to itself. 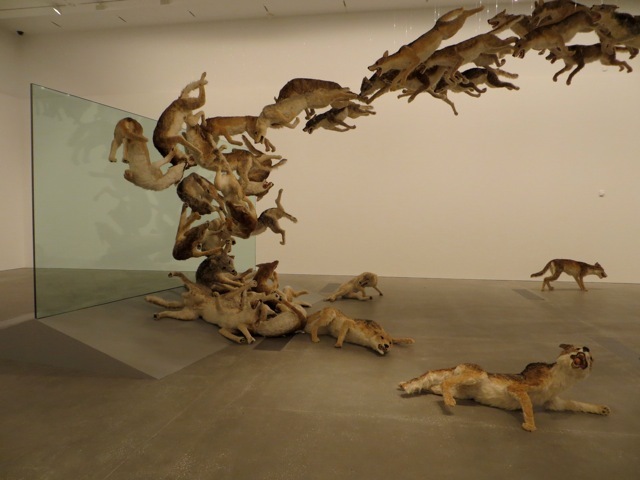 “Head On” (2006) freezes a cascade of 99 life-size wolves as they fly through the air, collide with a glass wall, shake off the impact and regroup to try again. The effect is both disturbing and mesmerising. Commissioned for the Deutsche Guggenheim in Berlin, the work seems to comment on Europe’s endless cycle of mindless warfare (a reading reinforced by a video of a burning German house projected on one wall). But far from the remnants of the Berlin wall, a more global interpretation comes to mind. Is the work a commentary on the violence necessary to national or personal change? Or an image of the artist’s journey? The fact that the protagonists are a pack of wolves may encourage a less generous response, but it doesn’t nullify a more neutral or hopeful reading. The wolves and the ambiguity reappear in the exhibition’s most discussed work, “Heritage.” But here Cai offers a multicultural vision of the mammal world. 99 animals, representing six continents, encircle a blue pool of water. Here the frozen moment is one of quiet and relief: the creatures are caught just as they are to take a drink. At first it seems a biblical vision of concord: one thinks of the Garden of Eden, Noah’s Ark, or the Peaceable Kingdom. As we walk around “Heritage,” we imagine a time when all species can learn to live together. We aren’t there yet: unlike “Head On,” visitors aren’t allowed to wander among the figures in “Heritage.” We must keep a distance (and take pictures; I’ve never witness so many selfies at an art exhibition). But further reflection makes this a rather melancholy work, actually less hopeful than “Head On.” The creatures, so life-like on first appearance, are actually a bit shoddy: they resemble the work of some Victorian-era taxidermist. Every minute or so a single drop of water falls into the pool, suggesting the inadequate resources if all these creatures drink their fill. And just what kind of cataclysmic event could bring together such a universal mix of creatures? Between these two exhibitions of memorable artifice lies a work of displaced nature, “Eucalyptus,” which is just that: an enormous eucalypt. It lies there, unadorned, impressive in its size. Nearby visitors are offered Chinese tea, and there are seats to contemplate the tree and reflect on the exhibition as a whole. Visitors must have appreciated Cai’s invitation: by the time I arrived, not a drop of tea remained. I enjoyed “Falling Back to Earth,” and I appreciated its ability to suggest complex global issues in accessible and visually striking ways (there is also an area for children to try their hand at Cai’s art—no gunpowder, of course). But my strongest response was the thought that this was art for an era of global migration. These works could be shown almost anywhere, and the audience would get it. They require little or no knowledge of local culture. Everyone will recognise some of the creatures in “Heritage” as local and others as exotic. The eucalyptus could be a maple (were it displayed in Canada) or an oak (were it England). Cai’s reimagining of the Chinese teagarden nods to his own heritage, and I liked the introduction of a seemingly Chinese trope—the contemplative literati community—into the exhibition. I was less taken with the long list of international corporations who helped finance the exhibition. But then again, I shouldn’t be surprised. I was seeing the future. Nice piece Tom. Your essays on The Migrationist always give me plenty to think about. Anything to challenge pre- conceived prejudices on immigration. I have visited that gallery on Southbank and am familiar with the walk you talk about. “Falling Back to Earth” is a powerful piece. Many thanks, Tony. Your comment made my day.